Community Clean Up - APRIL 27,2019 NEXT WALK - See below for Walk Maps. 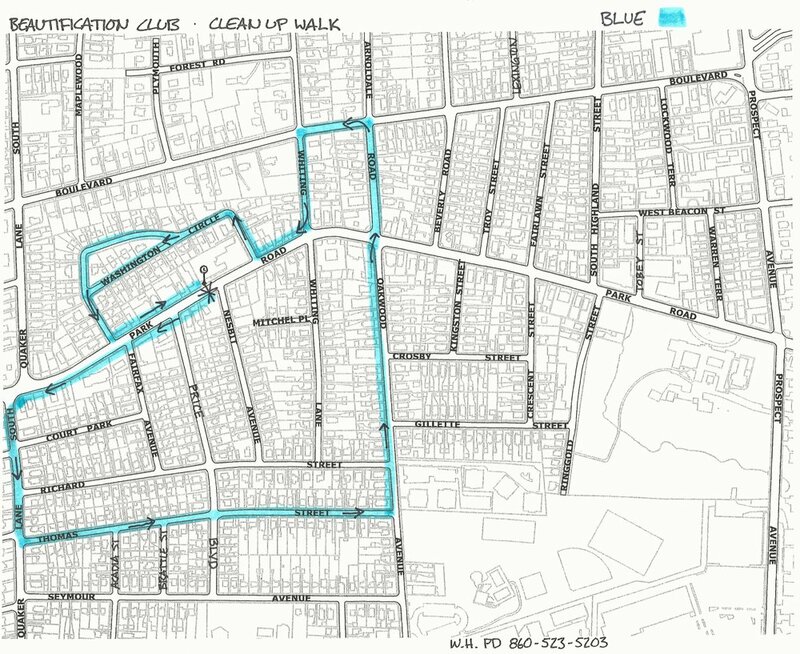 NEW-There are SIX routes for the April 27, 2019 Clean Up Walk. See Walk Maps below for the first four routes. You can download all of the maps in pdf format. We will fill the first four walks and then add Red and Green if required. We are looking for Two Additional Walk Captains for the Purple and Red Routes. See Beautification Club Members for the Red and Green Walk as maps are not shown. Red Walk will cover South Quaker, St. Charles, Kane, Prospect and Park. Green Walk will cover Price, Seymour, St. James & Nesbit. This includes the Smith School. WALK CAPTAIN: John Powers. This map covers, Thomas Street, Washington Circle, Oakwood Avenue and a small portion of South Quaker. Janie Barter is the Orange Walk Captain. This Walk begins at the Playhouse on Park. This walk covers Boulevard from Fairlawn to North Quaker and includes Oakwood and Whiting. The Yellow Map begins at the Playhouse on Park and finishes at Effie's Place. Covers South Highland, Prospect, Warren, Crescent and More, see map. We are looking for a Purple Walk Captain. All Walks begin at the Playhouse on Park. The Purple Map covers most of Richard Street, Gillette, Kingston, Troy and Beverly.